With the combination of our Catholic ABC’s preschool we’re working on and with All Saints’ Day just around the corner, I wanted to run some awesome saint crafts! I now made a printable set of alphabet Saints to go with my preschool program. They’re super fun and easy to make! The download comes in black and white and in color. Check out this “String from Heaven” craft made by my friend Jackie. So we are doing Elizabeth Foss’ Alphabet Path at home with our daughter. Since Ican’t paint we purchased the gingerbread cutouts of cardboard people atMichael’s. Each week I trace the outfits from construction paper for herto cut and paste them together to correspond with the pictures from An Alphabet of Catholic Saints for each letter. I do the faces typically and some ofthem I’ve cut too (you can probably guess which). We do this inaddition to cutting out the Letters (upper and lowercase) for the weekand gluing things that start w/ the letter or the actual letter frommagazines to that Letter’s page. And here are some more Saint Crafts A-Z! directions on making these kind of dolls at Crafty in Coffeeland. 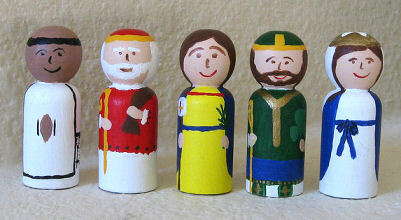 Painted Alphabet Peg Dolls from robynallen2 on Flickr. I have always been in love with Alice’s Spoon Saints! Ana Braga-Henebry’s Journal. I love these so much! Soon your saints will all come marching in! 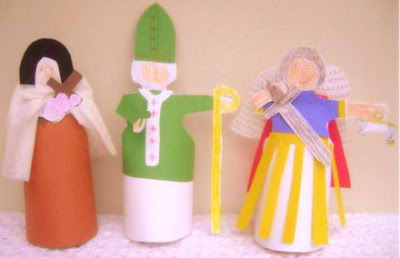 I hope your kids enjoy making some saint crafts soon – I know mine will! I LOVE that option I to was doing the alphabet path but can't for hte life of me find peg dolls so this would be PERFECT!!!!! thanks so much for sharing!!! 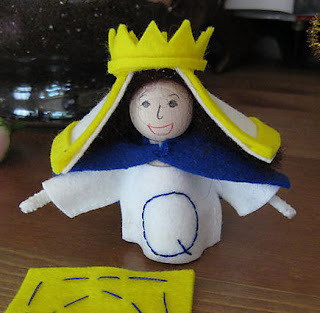 An Alphabet of Catholic Saint crafts would be great to do with a classroom of students. Put a name of a saint on a little pieces of paper and put them into a large container. Have each student reach into the container and pick a slip of paper to find out which saint they will make to hang in the classroom. I love the Alphabet Path, as do my kids!! Doing a garland of letters & Saints is a great idea, especially for those with limited space (like us). Thanks for all the wonderful ideas (here & overall on the site!). great and super cute idea!! Love your cute blog and your saints alphabet! A reader has pointed out to me that there is a problem with my pattern so I am in the process of redoing it! Will post it soon! Lacy, after reading this post the other day, we made the Saint dolls that Ana created a doll pattern for. what a joy it was to make these! and we posted about them today and linked to your All Saints Day link up! !